John Adams was the 2nd President of the United States of America, the symbolic leader of the country. His presidency began in 1797 and ended in 1801. He was 61 years old when he first began his term of office on March 4, 1797. John Adams was the father of John Quincy Adams who became the 6th US President. John Adams. He was named after his father, at the time of his birth there were less than 1000 first names and 35% of all males were called John! He had a variety of nicknames including Atlas of Independence, The Duke of Braintree, Old Sink or Swim, His Rotundity, and Bonny Johnny. The Colossus of Independence was the nickname that referred to his leadership in Congress in 1776. The nickname Old Sink or Swim referred to the words of one of his famous speeches. The picture of John Adams portrays an interesting image of what this famous man looked like. The picture shows the clothing and the hairstyle that was fashionable during his presidency. He is described as being 5 feet 6 inches tall with a stocky appearance, giving rise to the nickname "His Rotundity". 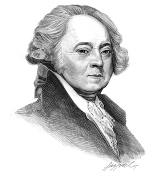 John Adams is most frequently pictured wearing a wig which was fashionable in his day. Under the wig was his own fine, brown hair and he had piercing blue eyes and a high forehead. He wore fashionable, expensive clothing. Like George Washington, John Adams also lost his teeth but he refused to wear false teeth which resulted in a lisp when he spoke. Character and Personality Traits: What was John Adams like? The personality of John Adams is described as determined, scholarly and ambitious. Friendly and warm with his close friends and family but uncomfortable with strangers who perceived him as being cold, aloof, arrogant and conceited. He had a volatile personality and was prone to experiencing bouts of depression and outbreaks of temper. "Let us tenderly and kindly cherish, therefore, the means of knowledge. The important role and duties of the President of the United States of America include those of Chief of State, Chief Diplomat, Chief Executive, Commander in Chief, Legislative Leader and Leader of his own political party. What was John Adams famous for? Why was John Adams important? The history and life of President John Adams during his presidency is conveyed in the following fact file in an easy question and answer format. What President was John Adams? He was the 2nd President of the United States of America. The dates of his presidency began in 1797 and ended in 1801 (March 4, 1797 to March 3, 1801). What other political offices did John Adams hold before his presidency? Who was John Adams' s first lady? John Adams was famous for the events and accomplishments of his presidency, but what are the facts about the man and his private life. Facts and information about the private life of John Adams can be found in the following fact file in an easy question and answer format. When and where was John Adams born? Where was John Adams educated? What was his religion? What did John Adams do before he became President of the United States? Who was John Adams' wife and when did they marry? Did they have kids? When did John Adams die? We hope that the picture, facts and information on President John Adams will prove helpful to kids, school children and schools learning about the presidency of this famous American leader. The facts about John Adams provides an overview of the President's character and personality traits. Watch the video and learn more about the major events of his life and his accomplishments. The following video is a useful educational resource for kids, children and schools learning about the life of this famous US President.